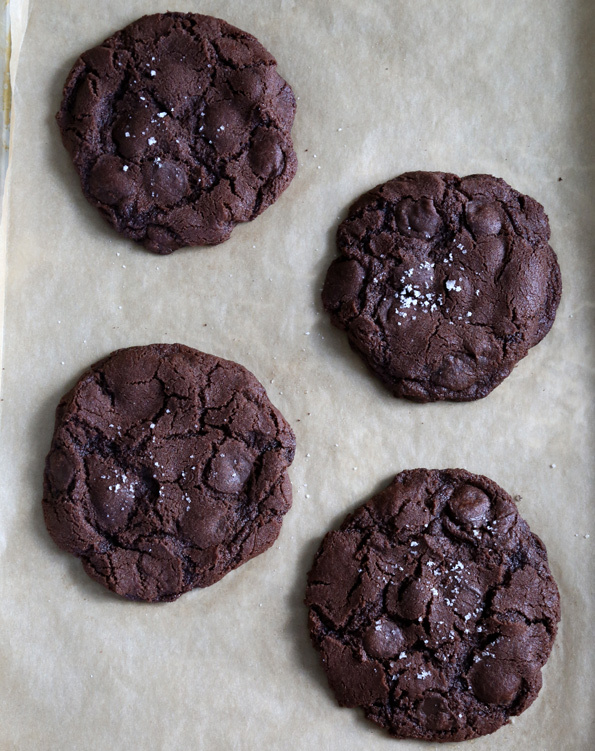 New York Times-Style Gluten Free Double Chocolate Chip Cookies | Great gluten free recipes for every occasion. [pinit] Once a person who calls herself a food blogger (that’s me!) has adapted the famous New York Times Chocolate Chip Cookies to gluten free (and then made an oatmeal cookie version), you’d have to imagine that a gluten free double chocolate chip cookies version isn’t too far behind. And even though my children are still away at sleepaway camp for another week or so,* I know that for some of you back-to-school has already happened (or is coming any day now). 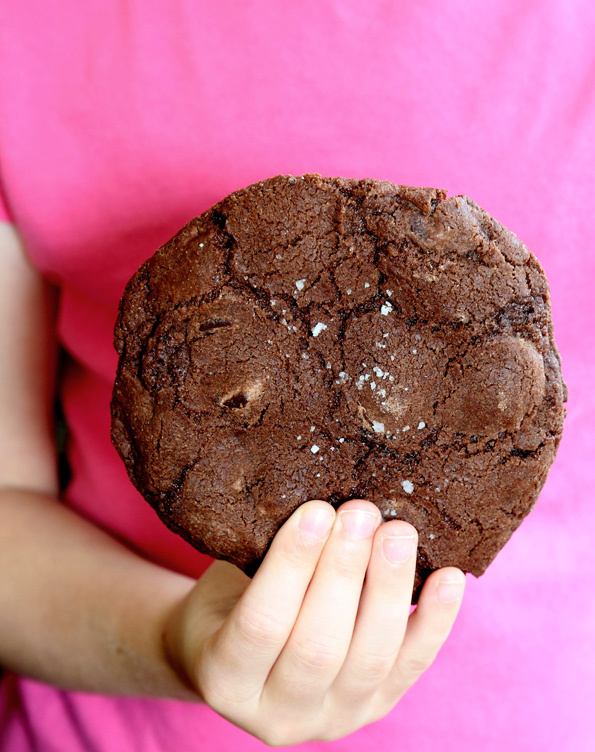 And there’s nothing that eases their way back to school like a surprise 5-inch chocolate chip cookie in their lunchbox. *If my children are away at sleepaway camp, then who is that lovely young hand model in the photo? That would be our neighbor’s young daughter, who graciously agreed to stand in for my youngest in the role. She was a total natural, and should probably look into an agent. Her future is bright. To keep the cookies from burning on the edges as they bake, just press the balls of dough into 3/4-inch tall disks. They’ll bake up just right. Now, if you’re new to this style of cookie, you’ll notice that they call for a few different kinds of flour—including the Bread Flour blend from my newest book, Gluten-Free on a Shoestring Bakes Bread. 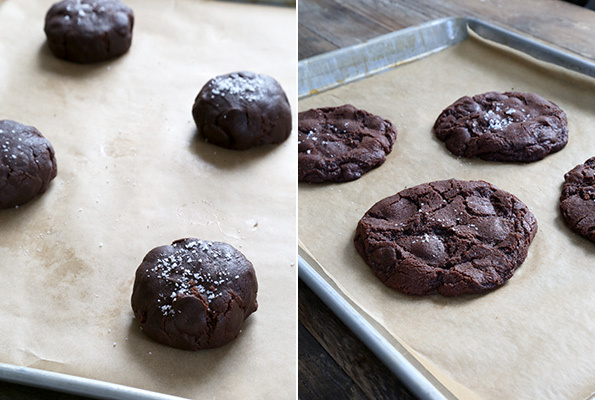 It’s this blend of flours that gives this style of cookie its unique crunchy-chewy texture. If you’ve never tried it, you’re really in for a treat. And of course, since we’re in for the double chocolate this time, it’s a chocolate-lover’s paradise. Give it a try! It might just become a new family favorite. In a small, heat-safe bowl, place the chopped butter and chopped chocolate. Place the bowl over a small pan of simmering water, making sure the water doesn’t touch the bowl, stirring occasionally until the butter and chocolate are melted and smooth. Remove the pan from the heat and set the bowl aside to cool briefly. (Alternatively, you can melt the butter and chocolate in the microwave on 60% power in 30-second bursts.) In a large bowl, place the all purpose flour, xanthan gum, cornstarch, bread flour, cocoa powder, baking soda, baking powder, salt and granulated sugar, and whisk to combine well. Add the light brown sugar, and whisk again to combine, working to break up any lumps in the brown sugar. Create a well in the center of the dry ingredients and add the cooled butter and chocolate mixture, plus the egg and vanilla, mixing to combine after each addition. The dough will be thick. Add the chocolate disks, and mix until they are evenly distributed throughout. Wrap the cookie dough tightly in plastic wrap, and refrigerate ideally for 24 to 72 hours. On baking day, preheat your oven to 350°F. Line two large rimmed baking sheets with unbleached parchment paper. Divide the dough into 10 balls, each nearly 3 1/2 ounces (the size of generous golf balls), and place them at least 6 inches apart from one another on the prepared baking sheets. Press the balls of dough into 3/4-inch thick disks, and sprinkle the tops lightly with coarse salt. Place in the preheated oven and bake until mostly set, but still soft toward the center (about 15 minutes). The cookies will spread to about 5-inches in diameter. Allow to cool on the baking sheet for at least 10 minutes, or until set. Adapted from my New York Times-Style Gluten Free Chocolate Chip Cookies, which are adapted from the famous New York Times Chocolate Chip Cookie recipe. P.S. If you haven’t yet, I hope you’ll consider picking up a copy of Gluten Free on a Shoestring Bakes Bread! Your support means the world to me. I mixed up the dough today, and if the cookies are half as delicious as the dough, they will become a regular feature around here. I think I will use peanut butter chips next time. These look absolutely delicious!!! I look forward to trying this recipe this week and making it my own by adding some nuts to the recipe. Thanks so much for sharing. Imagine adding white chocolate chips to this too! or peanut butter chips!!! oh my! I made the oatmeal ones and they were LOVE by all!